Tokomeza – to scatter, or destroy, or to reduce to nothing. In the autumn of 2013, a report commissioned by the government’s Wildlife Division and the Frankfurt Zoological Society concluded that the elephant population of the Selous Game Reserve had dropped to 13,000, its lowest recorded level. This is a drop of 80% from the previous survey in 2005, when there were an estimated 65-70,000 elephants. The cause of this decline was unrestrained, systematic poaching. At the current rate, in four years time there would no longer be any elephants left in the Selous. The Tanzanian government had no choice: it had to act. The result was Operation Tokomeza, a cross-services, multi-ministry attempt to end the poaching of large mammals in Tanzania. Initial success came in the form of increased seizures of illicit ivory, but this was soon overshadowed by horrific stories of beatings, sexual assault and even murder, some of which were recorded on mobile phones and posted on YouTube. MPs raised questions in Parliament, issuing a report that confirmed the existence of human rights abuses. The Minister for Natural Resources and Tourism, Hamisi Kagasheki, resigned, and three Ministers were sacked: the Minister for Home Affairs, Emmanuel Nchimbi, the Minister for Defence and National Service, Shamsi Vuai Nahodha and the Minister for Livestock Development, David Mathayo. In the last days of 2013, President Kikwete cancelled Operation Tokomeza. In the months that have followed, as ivory seizures continue and a number of Chinese nationals have been arrested (one successfully prosecuted and sentenced to 20 years imprisonment), the international media, led by the Daily Mail and ITV in the UK, has caught up with the story of Tanzania’s poaching crisis, ratcheting up the pressure on the government and focusing on what is being done to protect the wildlife that Mwalimu Nyerere vowed to protect. There is currently a struggle going on in rural Tanzania, where competing interests battle one another as well as the forces of the state that remain true to protecting the natural resources of Tanzania. To this battle must be added widespread ineptitude and inability to control men with guns but no sense of personal responsibility. A sense of fear pervades all those willing to contribute information for this article; not one would agree to be identified. They fear the consequences of becoming known to those with power, those with weapons, or both. 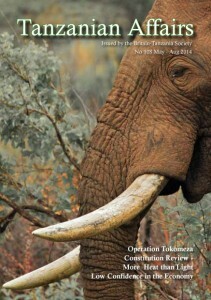 According to one source, close to, but not involved in, the operation in the vicinity of the Selous, Tokomeza was inspired by Operation Uhai, the 1989 ‘silver bullet’ that was seen to have successfully stopped poaching at the end of the 20th Century. Tokomeza was intended to repeat this, or at least provide a positive PR opportunity. While some involved in the operation were motivated by media coverage and not the actual result, committed individuals across the services, led by the Minister, Khamis Kagasheki, made comprehensive preparations. In the northern Selous, three lorry loads of soldiers from Tanga, three Land rovers of police field force from Morogoro, two TANAPA Land cruisers with rangers from Ruaha/Mikumi, and locally based Wildlife Division rangers arrived at night, and the next day were out in the villages. A similar pattern was also witnessed in the Ruaha National Park area and across Northern Tanzania. 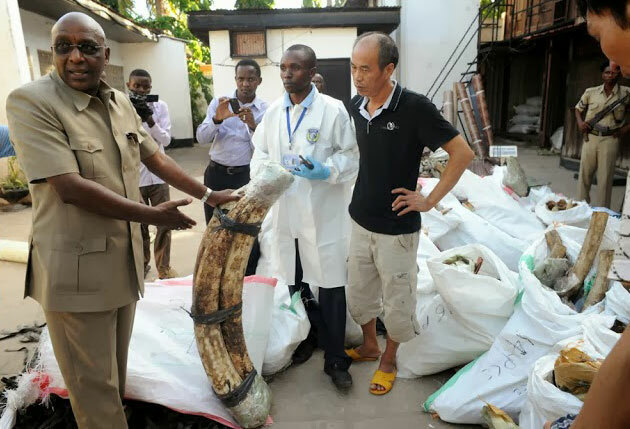 Results came quickly, for the first time in over a decade more illegal ivory was seized in Tanzania than in transit to (or in) the Far East. 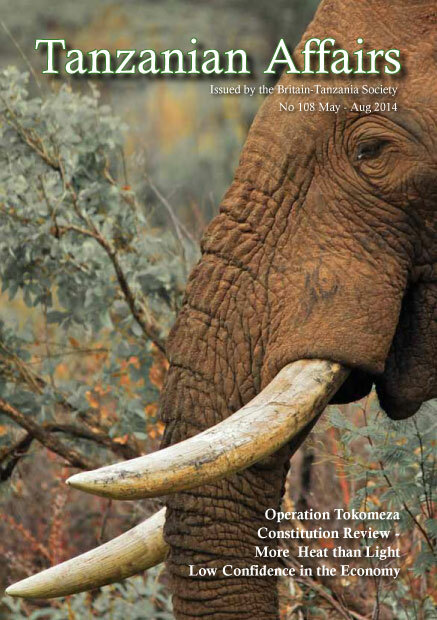 In 2013, there were 56 seizures of ivory in Tanzania totalling 8,255kg, the equivalent of what has been seized over the last decade, and 216 suspected poachers and traffickers have been brought to court. Mobile phones confiscated from poachers provided the security services with invaluable information that enabled them to quickly move up the poaching command structure from the villages to those commissioning the killings. In the opinion of the Selous source, two weeks into the operation the intelligence services had enough information to arrest a number of senior individuals, if there was the political will to do so. This information was compiled in a dossier that included the names of the senior people involved in the illegal trade, some alleged to be very close to the President. Yet, this is not just a story of personal aggrandizement. 2015 will be an election year in Tanzania. The ruling party is divided; new political parties threaten change; and elections campaigns cost large amounts of money. It is a sad joke that when safari drivers pass one another on a game drive and pause to ask the whereabouts of the animals that all tourists wish to see, they no longer use ‘masikio’ (ears) for the elephant, but the name of a senior ruling party official. Operation Tokomeza is a story of the appropriation of national resources for private profit. It is a story of ineptitude and unrestrained violence, but it is also an example of what can be achieved by the men and women of Tanzania committed to protecting the animals that continue to contribute so much to the development of the nation, even in these days of gas, gold and uranium. When Minister Kagasheki addressed the House prior to his resignation, he spoke of the need for an investigation into what really happened during Tokomeza. It is suspected he knows well enough, but he needs someone else to do the telling. There are calls in Tanzania for a second Tokomeza. Sadly, this is a story that will continue just as long as you can buy ivory in Mwenge Market. As of now, you can. In February President Kikwete attended the London Conference on the Illegal Wildlife Trade, and together with the leaders of Botswana, Gabon and Chad promised that he will not ask for permission from CITES to sell any of the Tanzanian ivory stockpile (currently 137 tons of ivory, worth over US$80 million). He further noted that the government was organizing financial and logistical requirements to re-launch Operation Tokomeza. “I’ll spearhead a movement to give Tanzanians a new constitution which will involve the entire nation’s participation. First, we’ll create a Constitutional Review Committee (CRC), headed by a very intelligent and well respected former judge. The CRC will collect the views of Tanzanians from all walks and ensure their participation, which will result in the preparation of a draft bill. That draft will be passed to a Constituent Assembly (CA) who will prepare a final draft, to be presented to the nation for a referendum. This should be a good way for me to finish my two terms as President and be remembered as the man who ushered Tanzania into a new, fairer and more hopeful era”. If only it was that simple….. Constitutional change has been welcomed by most in Tanzania, but understandably there has been much debate as to what changes need to be made. Whilst CCM and the President were never really for the idea of a three government solution (with separate governments for Zanzibar, mainland Tanzania and the Union) this has dominated all other proposed changes. The CRC were very much in favour of a three government system, and when they handed over the reins to the CA, they may have been expecting that the subsequent procedure of finalising the draft would be a mere formality. Judge Warioba announced at the end of December that 61% of the mainland and 60% of Zanzibaris were in favour of the controversial three government system. 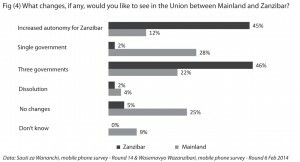 An independent opinion poll on the subject found that a large majority on Zanzibar (80%) support the three government proposal, while mainland Tanzania is split on the issue (43% in support) – see next article. In the last issue of Tanzanian Affairs we documented the problems and delays experienced by the CRC. There were anti-reform rallies against CCM and the CRC, a fight in the National Assembly and Chadema walk outs. Unfortunately the delays and debacles were not restricted to the CRC. The scheduled deadline for the CA to finalise the draft was 26 April 2014. Although the CA was sworn in on 18 February there was a month delay before any agenda matters could be kicked off, while the rules to govern the CA debates were discussed – including a lengthy debate as to whether clauses should be approved by open or closed ballot. An interim chairman, Mr Pandu Ameir Kificho, was appointed to chair the CA whilst they decided on who would be the permanent chairperson. According to Mr Kificho, the CRC misrepresented the nation by suggesting that Zanzibar was for a three government system, adding that the draft Constitution causes more problems than it solves regarding strengthening the Union. Parliament eventually appointed veteran legislator Samuel Sitta to chair the CA. In the two months since then, Mr Sitta has had his work cut out to quell various disputes which continue to plague the Assembly. After the delay, the question was raised as to whether the CA had the full 70 days to sit or 47 remaining days. Mr Sitta had to take some time to find the answer. An internal dispute then broke out in the CA over an alleged discrepancy in vote counting, followed by an argument over how much daily allowance committee members would receive. On one day members put aside the agenda of the day to demand increased pay, arguing that the Tsh 300,000 (£110) daily allowance was insufficient. Then, in mid-April, members of coalition group UKAWA, comprising assembly members from the main opposition parties and some members from independent groups, walked out of the assembly and threatened a series of protests against the draft, criticising the process. Insults and “discriminative sentiments” were exchanged among fac­tions within the assembly. At the time of writing, only a few sections of the second draft constitution have been debated. These sections deal with the structure of the government and the implementation of a three government system. It must be remembered that the CA must have a two-thirds majority for a chapter or the entire draft constitution to be approved and then presented to the nation for the referendum. At the moment, this does not appear likely. To the lay citizen this must be confusing and frustrating, given that many will not understand the need for such a change, which is dominating the agenda of proposed reform, putting aside important issues such as women’s rights, health, education and human rights. The sensitive subject of dual citizenship has also received little attention so far. One CA member has very recently called for the government to allow dual citizenship, but whether he can persuade his colleagues to include it in the final draft remains to be seen. The CA, not unexpectedly, requested an extension of the period during which it sits. It is now due to reconvene in August, to give time for parliament to convene for the budget session. The likelihood is that the assembly will request further extensions of time given that the other chapters of the draft constitution have not yet been debated. One certainty is that a new constitution is still a long way off, with political partisanship being an issue which needs to be deal with. There is clearly a lot of passion and interest from all sides regarding the constitution. It is hoped that such passion can be harnessed to finalise what has been a massive undertaking. President Kikwete may still leave a glorious legacy behind, but at the moment it looks as if a new and improved constitution may not form part of that legacy. Debates in the media and at the Constituent Assembly on the second draft constitution have included heated arguments on whether the draft has broad popular support. Most particularly, this focussed on whether there is popular support for the Constitutional Review Commission (CRC) proposal to establish a three government structure, with separate governments for Zanzibar, Tanganyika/Mainland Tanzania, and the Union. Two non-governmental organisations – Twaweza and the International Law and Policy Institute (ILPI) – have collected data to shed light on this. Together, they conducted a nationally-representative opinion poll survey, collecting people’s views on the current draft constitution (draft 2). 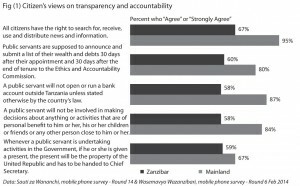 Data was collected on the mainland through Twaweza’s Sauti za Wananchi mobile phone survey panel, and on Zanzibar by ILPI’s Wasemavyo Wazanzibari survey. 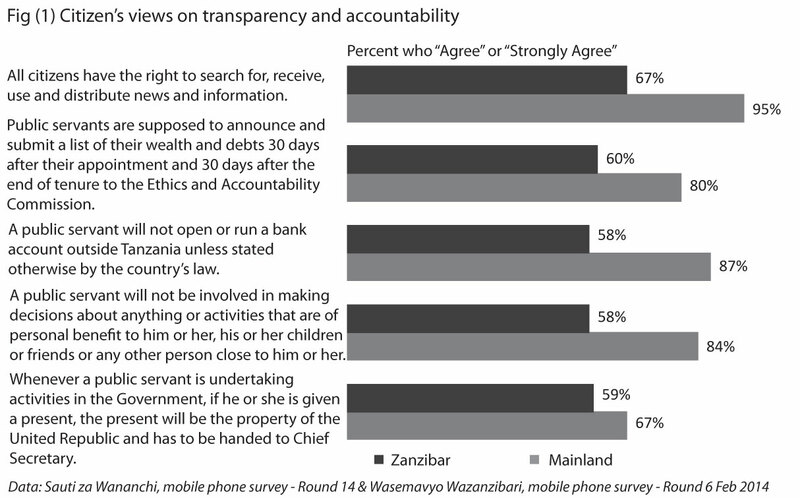 draft’s proposed measures to improve transparency and accountability (Figure 1). • Two thirds of respondents on mainland Tanzania support the proposal to allow independent candidates to stand for parliament and for the presidency (Figure 2). • When asked what kind of changes they would like to see in the relationship between the mainland and Zanzibar, there was strong support on Zanzibar for both the “three governments” proposal (46%) and for “more autonomy for Zanzibar” (45%). On the mainland, responses were spread much more widely, with significant numbers expressing support for single government (28%), no change (25%) and the three­governments (22%) (Figure 4). Fig (4) What changes, if any, would you like to see in the Union between Mainland and Zanzibar? • When asked whether they would vote for the current draft, just under two-thirds of respondents both on Zanzibar and the mainland said they would support it (Figure 5). Fig (5) Would you vote for or against the second draft of the constitution? • However, when asked whether they would still support the new constitution if the three government proposal was removed, support on Zanzibar dropped dramatically, to the point that a majority (53%) said they would not vote in favour of such a constitution. Two seizures of heroin were made in Tanzanian coastal waters within the space of a few days in late January and early February. Firstly, the Canadian military vessel, HMCS Toronto, found 265 bags containing over 280kg of heroin on an Iranian dhow. A few days later, an Australian ship, HMAS Melbourne, found 201kg aboard another Iranian dhow said to be travelling between Dar es Salaam and Zanzibar. The combined street value of the drugs found was estimated as a little over £500m. These seizures follow smaller amounts of heroin and cocaine pellets confiscated at Tanzania’s international airports. Last year the government sacked four officials suspected of aiding drug traffickers to smuggle 150kg of drugs through the Julius Nyerere International Airport (JNIA) in Dar es Salaam. In December, Police at the Kilimanjaro International Airport (KIA) arrested two foreign nationals alleged to be carrying 12.7kg of drugs. Two west Africans were arrested before boarding flights to Accra, Ghana and Cape Town, South Africa respectively. A Dar es Salaam resident was arrested in January at JNIA when attempting to board an Ethiopian Airlines flight to Macao, China. The woman was about to board her flight when she aroused the suspicion of anti-drugs personnel. Later that same month, a man holding a Kenyan passport was caught by the special drugs task force carrying 131 pellets of cocaine. The head of the Anti-Drugs Unit said the man had tried to enter the country through JNIA from Brazil. He has yet to appear in court. The UN Office of Drugs and Crime (UNODC) World Drug Report 2013 reported that Kenya and Tanzania are becoming major transit points for drugs as the number of drug users is also increasing. The report said that drug trafficking in East Africa has increased five-fold since 2009, indicating traffickers preference for the region as a transit route for drugs from Afghanistan, Pakistan and India to the US and Europe. (Guardian, Citizen, East African, Australian Associated Press). In April President Kikwete addressed a meeting at Chatham House, London, on Tanzania’s Transformation and Vision 2025. Despite the recent coverage of poaching, the threat to Lake Natron and explosions on Zanzibar, the President made no mention of tourism; he did, however, stress the need to improve infrastructure, develop industry and increase the local processing of natural resources. Widespread poaching continues to drain the life from Tanzania’s national parks and game reserves. 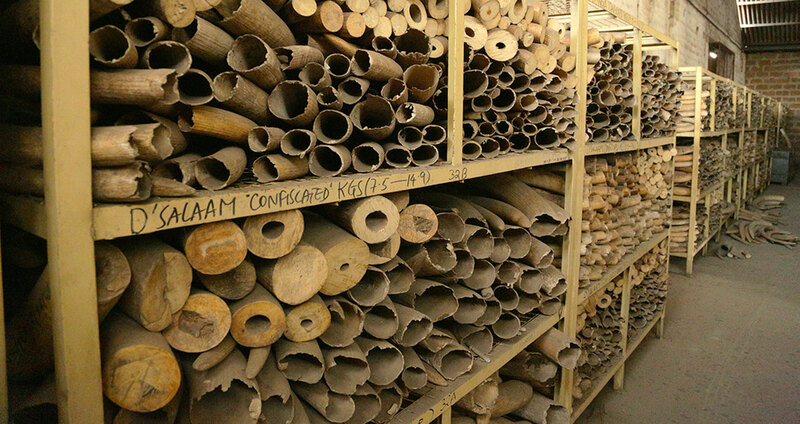 According to Martin Fletcher (Mail on Sunday 22 March), the Ministry of Natural Resources warehouse in Dar now holds 34,000 tusks – 17,000 dead elephants. That is still just a fraction of the animals lost, as confirmed by the recent Frankfurt Zoological Society aerial survey of the Selous Game Reserve and Kilombero Valley [see article on Operation Tokomeza]. On 25 March the new Minister for Natural Resources and Tourism, Lazaro Nyalandu, sacked the Chief Executive of the Tanzania Tourist Board Dr. Aloyce Nzuki, accusing him of poor performance and saying his position had become ‘untenable’. The sacking may have been due in part to Tanzania not making the top three at the prestigious ITB Travel Fair. However, it may also have to do with the fact that the Mail on Sunday article came from a fact-finding trip paid for by the Tanzanian government. Controversy continues over the proposed road through the Serengeti and the plans for a soda ash extraction plant at Lake Natron, both of which will, it is alleged, cause permanent damage to the charismatic wildlife that attracts so many visitors and the landscapes in which they live (see the website savetheserengti.org). The East African Court of Justice in Arusha has heard final submissions from both the Tanzanian government and the plaintiffs, headed by the Africa Network for Animal Welfare, who are seeking a permanent injunction against the road in its present proposed form. Sadly, violent attacks have occurred on Zanzibar once more. On 24 February, home-made explosive devices were detonated at the Anglican Cathedral and the popular Mercury’s Restaurant in Stone Town. Police recorded no casualties, although Reuters mentioned local reports of injuries. Although the event was picked up quickly by the Foreign & Commonwealth Office and published on its travel advisory, it did not generate much media coverage. 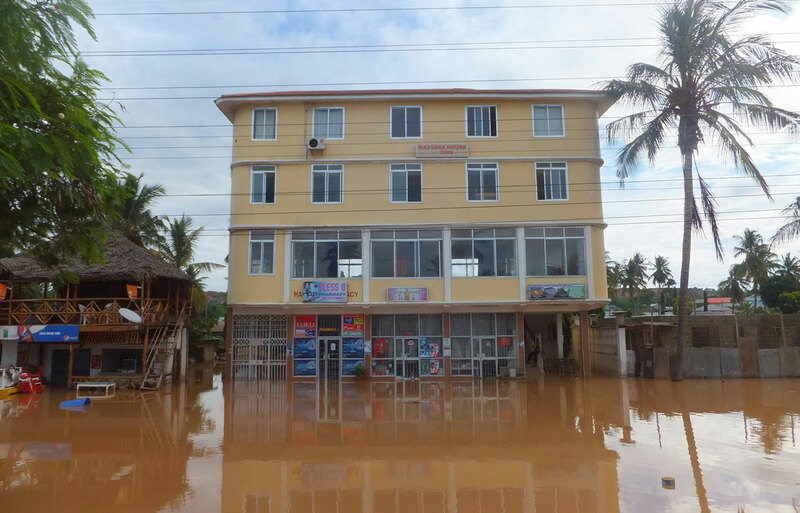 Over forty people died in Dar es Salaam, Coast, Tanga and Morogoro regions in March and April when prolonged heavy rain caused extensive flooding. Hundreds of homes in the Tandale, Kigogo, Tabata Kisiwani, Mwananyamala, Msasani Bonde la Mpunga areas of Dar es Salaam were swamped by the water. In many parts of Dar es Salaam, transport came to a complete standstill as storm water flooded road networks, leaving commuters stranded as services temporarily ground to a halt [See also transport section below]. In Morogoro there were reports that heavy rains that continued for three days wreaked havoc in many homes and destroyed roads and crops. The Director of Environmental Compliance and Enforcement at the National Environment Management Council, Dr Robert Ntakamulenga, said the flood problem in Dar is a man-made disaster caused mainly by gross violation of urban planning rules and failure by local govern­ment authorities to enforce the rules. “We need to ask ourselves who is issuing permits for people to build in river beds and our wetlands,” he added. In Dodoma, Members of the Constituent Assembly agreed to devote their TSh 70,000 sitting allowances for a single day to the ongoing government initiative to help victims of the floods that destroyed properties and damaged infrastructure. “If we all agree to sacrifice our sitting allowances for a day, we will have contributed Tsh 44 million to the victims of the downpour that affected Dar es Salaam and Morogoro residents,” said Ms Suluhu, the deputy chair of the Assembly. Heavy rains in early April caused traffic chaos in Dar es Salaam, as major roads became impassable. At one point the city was entirely cut off from the rest of the country as Morogoro Road became submerged at Ruvu, Mapinga bridge on Bagamoyo Road was washed away, and Mzinga bridge linking Mbagala and Kongowe on Kilwa Road was dangerously damaged. The cost of emergency road and bridge repairs was estimated at TSh21bn. Ethiopian Airline flight ET815 from Addis Ababa to Kilimanjaro, a Boeing 767-300 with 223 people on board, made an unscheduled landing at Arusha Municipal Airport on 18 December 2013. The Arusha airfield is only 1,620m long, less than half the length of the runway at Kilimanjaro International Airport, and well below minimum length for a plane of this size. The plane landed successfully, but became embedded in soft ground when attempting to turn around on the narrow runway. Passengers were stuck on the plane for several hours while steps were brought from Kilimanjaro to Arusha, as the smaller airport did not have facilities for a plane of this size. The reasons for the error were the subject of dispute between Ethiopian Airways and Tanzanian air traffic control. It seems a miscommunication between the pilot and air traffic control led to the pilot mistakenly assuming that Arusha airport was in fact Kilimanjaro. China’s total direct investment in Tanzania increased from US $700 million in 2011 to US $2.1 billion last year, becoming the biggest foreign investor in the country. Bilateral trade has soared in the same period, reaching over US $2.5 billion by the end of 2012. According to Imara Equity Research, this investment is focused on railways, ports, road construction, gas pipelines and wind power farms. It has not only boosted economic growth but also created more than 150,000 direct jobs. Up to 19 projects worth billions of dollars include construction of the new port at Bagamoyo, set to be the largest and most modern in Africa. The harbour is expected to be in operation by 2017 and will handle 20 times more cargo than the Dar es Salaam, which is Tanzania’s current major import and export gateway in East Africa. Additionally, a Chinese US $1.2 billion soft loan for a 523km pipeline connecting Dar es Salaam and the Mtwara gas field was endorsed in September 2012 between the Tanzanian government and the Exim Bank. The East African Community (EAC) Monetary Union Protocol was signed in December 2013 by the five heads of state in Kampala, kicking off ambitious plans to have a common currency within 10 years. The single currency is aimed at enhancing trade in the region. Mobile money platforms offer instant money transfer using phones, which helps cut costs and saves time as compared to physically transporting money. The value of mobile payment transactions jumped more than three times in the twelve month period ended December 2013. This was due to increased use of mobile phones in payment of services such as utility bills. Further, several banking institutions have formed partnerships with mobile network operators to facilitate customer transactions, according to the regulator in its latest Banking Supervision report. Tanzania faces a new debt crisis unless government moves fast to contain its current borrowing, which has seen national liabilities more than double in less than 10 years. Until around 2006, the public debt as a percentage of GDP was almost 70%. Debt forgiveness brought that ratio down to about 21% the following year, but since then it has been growing at an alarming rate.